At first glance, this unique set of cutlery seems malformed—five weird implements that blend the characteristics of knives, forks, spoons, and tongs. However, closer inspection reveals that each tool seems cunningly manufactured for a specific purpose. Moreover, the craftsmanship is exquisite. Made from expensive aluminum and bearing French markings, the cutlery is lightweight yet durable, and comes bundled in an elegant brocade wrapping, complete with a neat set of white gloves. The brocade has the name “Marjorie” sewn into a corner. Touching one of the implements brings a sense of revulsion, and triggers an immediate Spirit roll vs. TN-4. A success brings a horrific flash of understanding, a visual image of what the cutlery was designed to do—an eyeball being plucked out, brains being dissected, hearts being severed from their vessels and devoured! Failing the Spirit roll unleashes the same impressions, but rather than horror, the accompanying feeling is one of curiosity, even…hunger. Indeed, if this character takes possession of the cutlery, the next time he finds himself near a human corpse, another Spirit roll just might be required to keep him from trying out his new dinnerware! 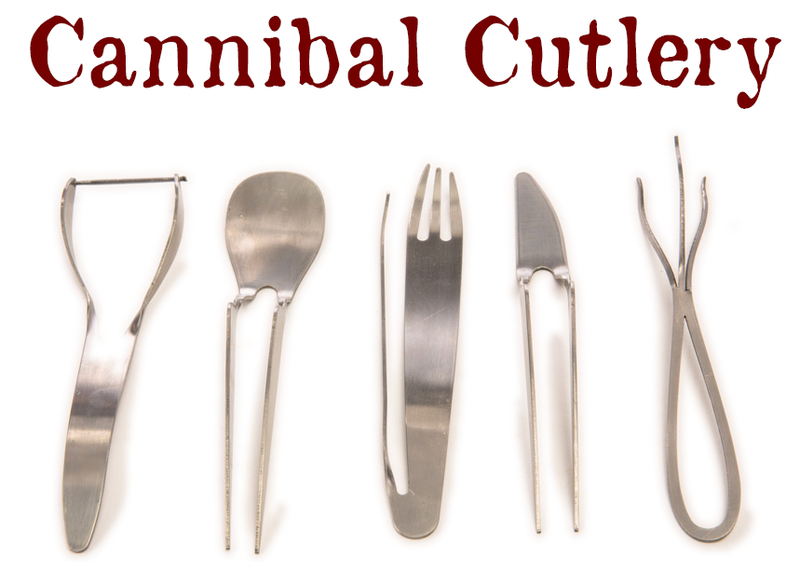 Once per day this set of cutlery may be used to consume human flesh—raw or cooked, it does not matter. Given five rounds of eating, the cannibal gains a +2 Vigor Kicker and may choose to absorb a single Trait from his “dinner.” Obviously, this is up to the Marshal, but typical examples include a +2 Trait Kicker, a single-use Fate Chip, or a limited-time Skill transfer. For instance, Colonel Ives has just shot and killed a Cree warrior. Dragging the body to a coulee, he uses the Cannibal Cutlery to excise and devour the poor man’s face. Five rounds later, the Colonel has obtained a +2 Vigor Kicker. When asked what Trait he’d like to “absorb,” the player expresses the desire to “ride like a Cree.” The Marshal gives Colonel Ives a d10 Riding Skill for the duration of the battle. I love the creep factor here. Very nice.